Tecnoshops s.r.l. is currently working on the project. 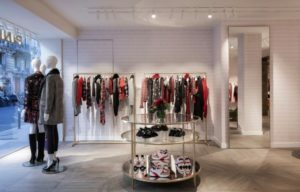 Pinko, the Italian women’s fashion brand with over 500 retail locations worldwide has opened this week a new store at Königsallee 56, Düsseldorf. The well-known Italian brand continues its international expansion with a new store on Rue du Four, Paris. Pisi Design and Tecnoshops are the companies who have worked with the brand on the project.